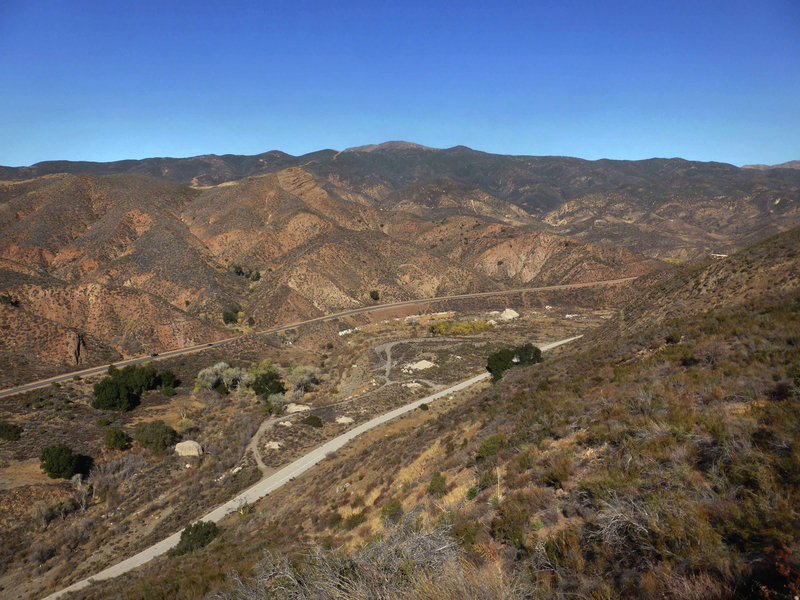 SCVHistory.com HB1402 | St. Francis Dam | Dam Rubble Today (2014). November 14, 2014 — Large chunks of the St. Francis Dam can still be seen in San Francisquito Canyon between LADWP Power House No. 2 to the southwest (not shown) and the former dam site (behind the hill at upper right, where a portion of the wing dike is visible if you "click image to enlarge"). 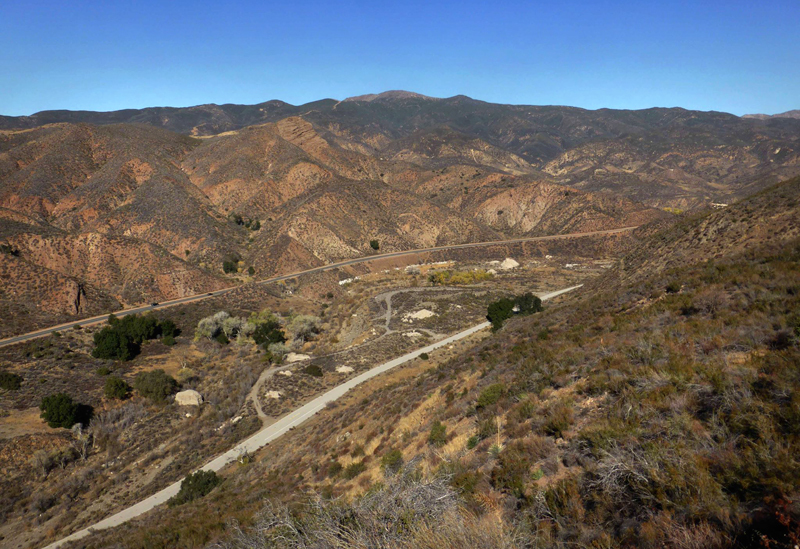 The top-most road is the current 2005-2006 alignment of San Francisquito Canyon Road. 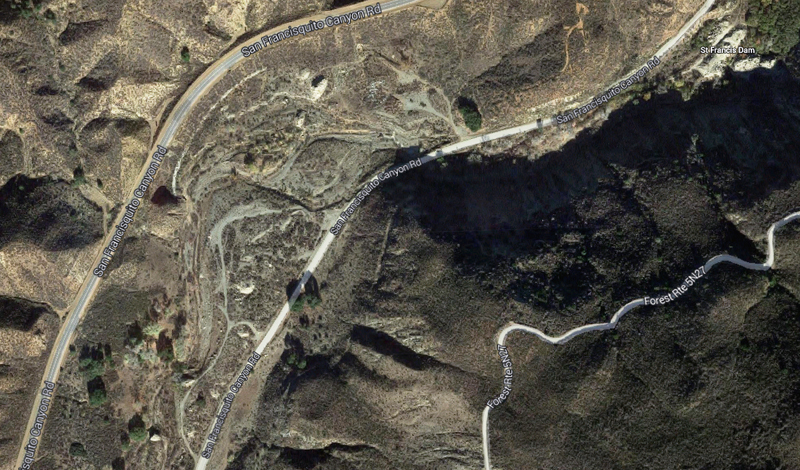 The lower road is the previous alignment of San Francisquito Canyon Road, now closed. Photo by CSUN Professor James Snead from the ridge near the Bee Highline Road, aka Forest Route 5N27. Off to the left, mostly out of frame, was the Power House No. 2 community. It consisted of "eleven bungalows, a club house, a school house, with garages for the accommodation of the personal and departmental cars (which were) scattered in various places where flats beside the stream afforded protections from ordinary floods and were located largely to take advantage of the grown native trees" (Stansell 2014:31). The northeastern-most structures of the community would have been visible in this photograph. The diagram (Fig. 2.6) on page 31 of Stansell (2014) suggests that the Bee School No. 2 stood at the left side of this photo, between the two road alignments. The Neilson family cottage probably would have been in frame at far left. Dam historian Frank Rock reports that a neice of damkeeper Tony Harnischfeger described Harnischfeger's cabin as being "near the base of the trail to the current overlook of the main ruins." That would be at the right-hand side of the plain seen here. The neice's assertion "fits the description of a hill where (Harnischfeger) supposedly dug steps up the hill in case of an emergency," Rock writes (2014 PC). HB1402: 19200 dpi jpeg from digital image 11-14-2014 by James Snead.